The ABA studios are available to rent for regular, weekly dance classes or other weekly rehearsals. There are six foot high mirrors, beautiful almost floor to ceiling windows, vinyl / marley flooring and a platform area in the larger studio. In addition to ballet classes and rehearsals, the venue is currently supporting morning Jazzercise classes. 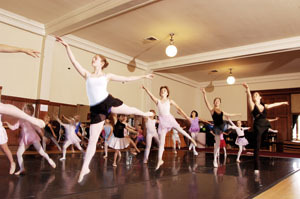 For studio rental information, please email Alameda Ballet or call 510-337-1929.